4.8/5 stars – based on 32 reviews. We use cutting-edge, innovative surgical techniques for facelifts to help patients achieve the best results possible. Patient safety is our top priority. We only engage the most experienced, board-certified anesthesiologists from the Boston PainCare Center. Take a look at some of the glowing reviews written by our facelift patients. If you have started to notice aging changes to your facial appearance and are ready to do something to improve your look, then you may be a good candidate for a face and neck lift. To learn if a surgical facelift is right for you, contact Wellesley Cosmetic Surgery today. How To Know If You’re An Ideal Candidate For A Facelift? 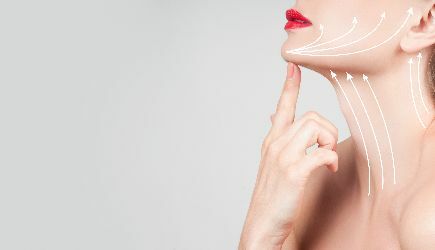 The best candidates for a face and neck lift procedure are people who have developed signs of facial aging: moderate to severe jowling with loss of jawline definition, sagging of the neck skin and muscles and loss of volume in cheeks. During your consultation, your plastic surgeon will determine if you are a good candidate for this procedure and will discuss all the options open to you. What Does A Face And Neck Lift Do? The modern face and neck lift strive to restore a natural, refreshed look to the patient. Rather than pulling on the skin to produce results, we address the actual aging problem: stretching of the underlying facial muscles and connective tissues and undesirable skin changes which come along with that. During the procedure, the muscles and tissues in question get tightened using special hi-tech sutures, thus, repositioning the soft tissues of the face in their natural position. The extra skin is then removed. This combination gives a patient the best possible result: a long-lasting, natural and youthful look. How Long Does The Results Of A Facelift Last? Results will vary depending on the patient’s age, lifestyle and skin quality and type. In general, the results of a surgical facelift can last, on average, up to ten years. Does A Face Lift Involve Incisions? Yes, incisions are necessary. However, incisions on the face tend to heal much better than elsewhere on the body. There are also things that can be done to improve the face and neck lift scars. 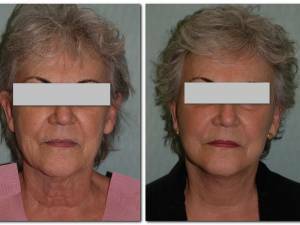 Where Are Facelift Incisions located? The facelift incisions typically are hidden under the chin and around the ears and in the hairline. Dermal fillers and Xeomin/Botox can greatly enhance and complement the results of a face and neck lift procedure. However, fillers and Xeomin cannot be substituted for a facelift. When Will I See Results From A Facelift? Some of the results will be visible immediately after the procedure. More results will become evident as the swelling subsides. How Much Does A Facelift Cost In Boston, MA? The price of the procedure will vary depending on the exact work that is being performed on the face. Be sure to have this conversation with your plastic surgeon ahead of time, so you know exactly how much you will be expected to pay. At Wellesley Cosmetic Surgery, we offer financing plans to our patients, so they can make small payments towards their procedure. If you’re interested in learning more about these options, contact our office today at (617) 237-6061 or (781)-239-0680 today! Do you want to remove laugh lines, wrinkles, and jowls? If you’re interested in a surgical facelift, get in touch with experienced Boston plastic surgeon, Dr. Arthur Shektman today. Dr. Arthur Shektman is a board-certified plastic surgeon that has served patients in this area for over two decades. He regularly performs facelifts, brow lifts, breast augmentation, breast reduction, breast lift, liposuction, rhinoplasty, eyelid surgery, tummy tucks, and other body contouring procedures. Our entire team—including Dr. Shektman—is dedicated to helping patients look and feel their best! We currently serve patients in Wellesley, Boston and throughout the state of Massachusetts. To schedule a consultation, please call our office at (781)-239-0680 or (781)-239-0680 today. You can also begin an online consultation by uploading a photo to our website and describing the services you are most interested in. During this consultation, you will learn more about our services and our commitment to achieving natural-looking results for all patients. If you are a new patient, don’t forget to review the before and after photos posted on our site to see some of our previous work. Wellesley Cosmetic Surgery provides excellent service and superior results. Dr Shektman and his staff are very professional and caring. Dr. Shektman is very knowledgable and is able to explain very clearly the benefits as well as the potential risks involved in cosmetic surgery. I had a facelift 2 months ago. When I first came to the cosmetic center I was very nervous and the ease of the doctor and the staff calmed my nerves. They are so easy to make an appointment with and seem to always be there when I needed to come into the office. Two months after my face lift I’m so happy with the results and will definitely go back to see the doctor for further procedures. I am extremely pleased with both the staff and the result. Dr Shektman is completely professional, realistic, as well as concerned about the total well being of his patients. The staff is friendly, helpful, and supportive. I highly recommend Dr Shektman. Wellesley Cosmetic Surgery provides excellent service and superior results. Dr. Shektman and his staff are very professional and caring. Dr. Shektman is very knowledgable and is able to explain very clearly the benefits as well as the potential risks involved in cosmetic surgery. He explained that team work is key to achieving excellent results and how important it was to be comfortable with your choice of a surgeon. During my recovery I called the office (one time after hours) and received prompt responses. I am thrilled with my result and will be returning to Dr. Shektman in the future. I was referred to Dr. Shektman from a close friend who also had a breast augmentation procedure. My entire experience from initial consultation to surgery to both follow-up appointments was excellent. Dr. Shektman is professional, warm and kind and made me feel so comfortable from start to finish. I walked into my consultation appointment very insecure with my body and walked out of my 6 week post-op visit a new confident woman! I highly recommend Dr. Shektman and will be returning in the future if I ever feel like I need a surgical confidence booster again! From the first appointment, I felt comfortable and confident with Dr. Shektman. As with any surgery, I was a little nervous when the surgery date was upon me. But that nervousness lasted about 30 seconds after I entered his office. Everyone involved in my care were wonderful..caring and professional. My results were great. Dr. Shektman took a lot of time explaining the procedure, risks...etc. Scheduling my follow ups were a breeze. I have had no complications and my breasts look great.